We take pride in our world-class customer service! See our hottest topics of discussion below and be sure to contact us if we didn't answer your questions. Here at Carl's, we do our best to make every customer's experience unforgettable. Let us knock your socks off with our world class customer service. See some of our most common topics of discussion below. Don't see the answer you're looking for? Click through to our detailed information for the nitty-gritty. If you still have questions, feel free to shoot us an email or give us a call at 248-335-8095! We're happy to help answer your questions. We strongly believe in getting your product in-hand as fast as possible! Being in Metro Detroit, we are centrally located, so getting you your goods in a timely manner isn't a hassle! Orders placed on our website for in-stock items are shipped next business day and if placed before 11 a.m. EST will leave the same day. We primarily ship with UPS and offer a plethora of affordable, expedited shipping methods. We are constantly negotiating with our carriers to be sure you are getting the best shipping prices/services anywhere. For in-stock items shipping next day, you will receive an email confirmation of your order shipping with your tracking information. In the unlikely event your order is out-of-stock, a customer service representative will be in contact with you to discuss options or actions taken to fulfill your order ASAP. Please see our detailed SHIPPING page for more information. Carl's Golfland takes security very seriously and implements the highest standards in online fraud prevention to best protect our customers from today's online risks. You can feel safe purchasing from Carl's Golfland as our pristine track record is a testament to our level of security. With our EVERYDAY FREE RETURNS, it's easy to see that we've got you covered. Simply visit our RETURNS page to obtain detailed information as to whether or not you qualify for a return. Fill out our easy-to-understand returns form to obtain a pre-paid UPS label to have your stuff sent back...that's it! Our speedy return's department will be sure to process your refund within 1-2 business days upon arrival. *Helpful Hint* Keep your tracking information handy to see when your package arrives that way you'll know when to expect your refund. In order to exchange your merchandise, be sure to send your product back to our facility using our EVERYDAY FREE RETURNS process. Whenever convenient for you, replace your order for the correct/desired product. We'll be issuing a refund for your returned merchandise within 1-2 business days of its' arrival. You can also wait to receive your refund first before placing...it's totally up to you. Have additional questions? See our RETURNS page for more. We accept all major Credit Cards and PayPal. If you are having trouble placing your order online, give us a call, we can do it right over the phone as well! We work hard with our vendors to offer you the guaranteed lowest prices vs. any of our competitors and never hesitate to slash prices! See our LOW PRICE GUARANTEE page for more information. Our 30-day price protection policy is in-place to help with that as well. Be confident purchasing from Carl's as we are always the pricing leader when it comes to your golfing needs. Carl's Golfland currently doesn't offer any sort of online coupons, but we do run promotions from time-to-time. Generally, any promotion we offer will automatically be applied to your cart to make your shopping experience as seamless as possible and to give you peace-of-mind. Some manufacturer restrictions may apply so please read the fine print to see if you qualify. All gift cards redeemed will be reviewed by Carl’s Golfland customer service for validity and value. Orders are not deemed accepted until gift cards are validated and approved. Despite our efforts, the information on the "website" may occasionally be inaccurate, incomplete or out-of-date. In the event of a pricing error or discrepancy on a Site with respect to products or services, We reserve the right to cancel any orders (or partial orders) for such products or services. In compliance with sales tax laws, we automatically collect sales tax for those states that require it, including Michigan (our physical location) and Arkansas, California, Georgia, Illinois, Indiana, Iowa, Kansas, Kentucky, Maine, Maryland, Minnesota, Mississippi, Nebraska, Nevada, New Jersey, North Carolina, North Dakota, Ohio, Oklahoma, Rhode Island, South Carolina, South Dakota, Tennessee, Utah, Vermont, Washington, West Virginia, Wisconsin & Wyoming based on the ship-to address you specify* at checkout. If you are shipping to any of these states, the appropriate charges will be added to your merchandise total and displayed on your final order confirmation. *NOTE: We are not required to and do not collect sales or use tax in states other than those stated above. However, internet sales to some states might be subject to use tax in the state in which you reside. For more information, visit your state’s tax information website. Our customer service hours vary by season, but we can typically be reached by phone between 9am EST and 7pm EST. You can also reach us through our CONTACT US page. Fill out a brief inquiry and send it over with any pertinent information. We'll be sure to get back with you within 1 business day. When you shop at Carl's, we want you to know you're getting the lowest price anywhere! We make your buying decisions easy so you don't have to do all the shopping around. We also feature a 30-day Price Protection Guarantee and Price Matching Policy to make sure you're covered if we slash a price or if our competitors pull a fast one on us! See our LOW PRICE GUARANTEE here. Orders placed with Carl's Golfland will be shipped within 1 business day! In the rare instance of an out-of-stock item, one of our customer service representatives will be in touch with you to discuss options or course of action. Absolutely! As soon as your product is picked up by the carrier (generally around 5pm EST), emails are automatically uploaded to your order and emailed to you! As long as you have your email address typed into your order correctly, you'll get one. If you don't, be sure to check in your SPAM folder. Every so often we see these emails end up there. The answer to this question is largely based on the type of shipping you selected upon checkout and where you're located. If you chose standard shipping, see the map below. If you chose an expedited shipping service (UPS Next Day Air, 2 Day Air, 3 Day Select), you can expect your package is guaranteed to be delivered in that amount of time. Please note the first business day is the first business day AFTER your package ships. Example: If you place your order on Friday with Next Day Air Service, your package will ship the next business day (Monday) with overnight service, arriving on Tuesday. This map is a great way to figure out if you need expedited shipping or not! If you received your tracking number email, simply plug that number into UPS's tracking system on their website. See the diagram below to find out where to type your tracking number in. For international shipments or USPS shipments, you'll need to track these with USPS. Almost all of our shipments are shipped with UPS and you will be notified if shipped differently. 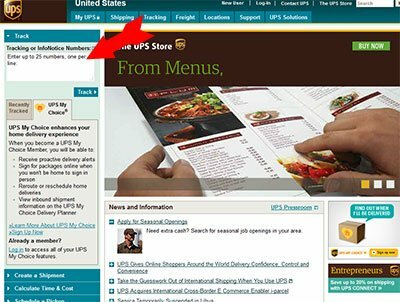 Type your tracking number into the box in the upper-left hand corner of the UPS website (see red arrow above). Yes! Believe it or not, being located so close to Canada, we're pretty popular north of the border! We ship internationally on a daily basis - Germany, Australia, you name it! Simply add the product(s) to your cart to see our live shipping rates. Unfortunately at this point in time, we are unable to ship to Military APO/FPO addresses. Please contact our customer service department for available options. Absolutely! We offer the best and easiest to understand returns process in golf! Simply visit our returns page for the details. Personalized or custom items do not qualify for a return/refund. As long as the product(s) is still in new/unused condition, you qualify! No worries! Most of the time when your tracking number hasn't updated, it's because UPS hasn't scanned the package into their hub yet OR they missed a scan. This doesn't mean your package isn't on the way; it's just not tracing yet. Be patient! Tracking information should update within a few hours after you receive your tracking number email. Most of the time when your card is declined its typically because of incorrect billing address information. Please keep this in mind if you're shipping someplace other than where the card is physically billed to; our processing system is looking for that information to match up...for security reasons of course. You also want to make sure you've inputted your credit card #, expiration date and security code correctly. You'll receive confirmation as soon as your order goes through successfully. If you've placed a declined order or multiple declined orders, there may be pending charges on your credit card statement. No worries! While they appear to be charges, we don't have any authorization to settle against declined transactions. These pending charges will usually wipe out from your statement within 24-48 hours. Am I responsible for Sales Tax? In compliance with sales tax laws, we automatically collect sales tax for those states that require it, including Michigan (our physical location) and Illinois, Indiana, Kentucky, Maine, Maryland, Minnesota, Mississippi, New Jersey, North Carolina, North Dakota, South Carolina, Washington & Wisconsin based on the ship-to address you specify*. If you are shipping to any of these states, the appropriate charges will be added to your merchandise total and displayed on your final order confirmation. *NOTE: We are not required to and do not collect sales or use tax in states other than those stated above. However, internet sales to some states might be subject to use tax in the state in which you reside. For more information, visit your state’s tax information website. Do you ship signature required? No. We understand you're busy and not always home to receive your package(s), so we don't ship with signature required. If UPS is uncomfortable leaving the package in fear of damage or theft, they may require a signature upon delivery. I already placed my order and it hasn't shipped yet, can I change my order? If your order hasn't physically left our facility yet and your package hasn't been packed yet, there's a chance we can still alter your order. We ship very quickly, so the sooner you contact us to change your order, the better. Calling our customer service department is the most effective way to get this completed.